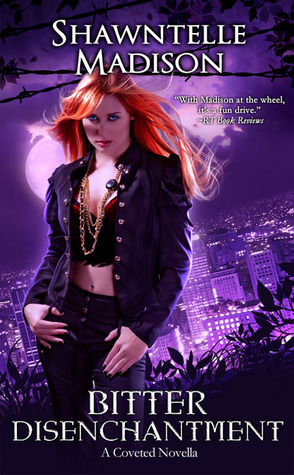 Shifter Agatha McClure, aka Aggie, is the only daughter of Desmond McClure, the powerful alpha of the Midtown wolf pack. Desmond is making changes at home, to include leaving Aggie’s mom and mating with a new wolf, one that will produce an heir to take over the pack someday. In addition, he’s also declared it is time for Aggie to marry, introducing to Aggie her intended, Victor. Not one to take things lying down, Aggie refuses to just sit back and marry Victor until she gets to know him better. Unfortunately for Aggie, it isn’t until after she marries Victor that she finds out he’s not the man she hoped he’d be. While reading the first two books in Ms. Madison’s Coveted series, I’d grown rather fond of Nat’s best friend, Aggie. But after reading Bitter Disenchantment, I’ve learned to love Aggie. She is one tough wolf and full of amazing fortitude. She never complains and learns when to pick her battles, especially with her father and her husband. She stays focused on what is important, but remains flexible enough to roll with the punches (literally!). I hope that Ms. Madison pens another tale from Aggie’s POV. Both Desmond and Victor are devilish antagonists. Desmond’s cruelty is overtly dominant, while Victor hides behind a polished exterior. The pair are beyond controlling, attempting to bend the world and people around them to their individual wills. They are so easy to hate, which makes me cheer for Aggie even more. Overall, the story is well written. The author does a fabulous job chronicling the degradation of Aggie’s marriage and hopes. The means by which Aggie chooses to escape is an interesting one, and it goes to show how desperate she’s become. I enjoy her interactions with fellow fighter, Paula and Paula’s children-it shows what a good, kind and caring person Aggie is. In addition to the primary storyline of Aggie’s efforts to break free from her husband, there is a mysterious group of spellcasters after her. Although this is a minor thread, it has just enough meat to add some intrigue. In the end, Bitter Disenchantment is a wonderful novella with a lot of substance. The story has an emotional edge and depth that had me shedding a few tears. I enjoyed the themes of overcoming odds and creating friendships, and about allowing someone else to fight for you once and a while. The story has a lot for being a shorter book. Friendship, betrayal, love and loss. Excellent story.